I love a pretty red polish. Finger Paints Curator's Crimson is from a Christmas Duo in 2011. I really enjoy wearing it. It's a gorgeous tomato red crelly. Super shiny and wears great. Formula is just right as well. I really like Finger Paints. The more colors I buy and use the more I realize they are an amazing company and make some awesome polish. For my accent nail I used China Glaze Love Marilyn from the 2011 Eye Candy Collection. 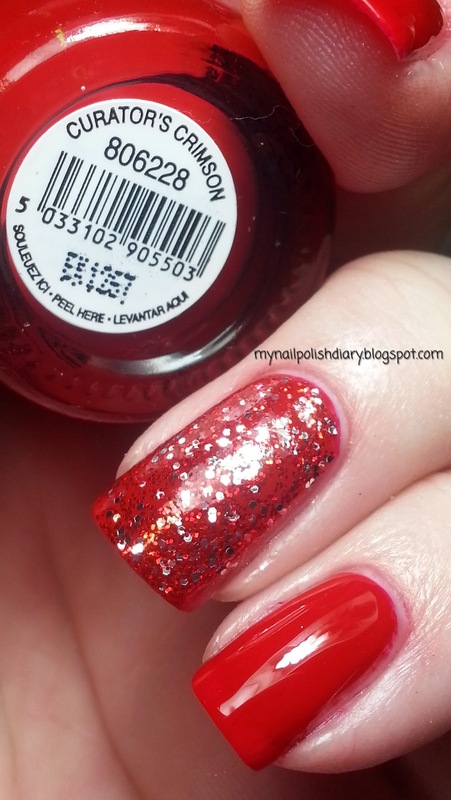 It's red and gold glitter and goes perfectly with this mani. I love a glittery accent nail.